In this lesson we explore generated content and how we can use this in conjunction with the :before and :after pseudo-elements to insert information into our web pages. We also learn how to generate quotes and how to add and reset counters for an element. 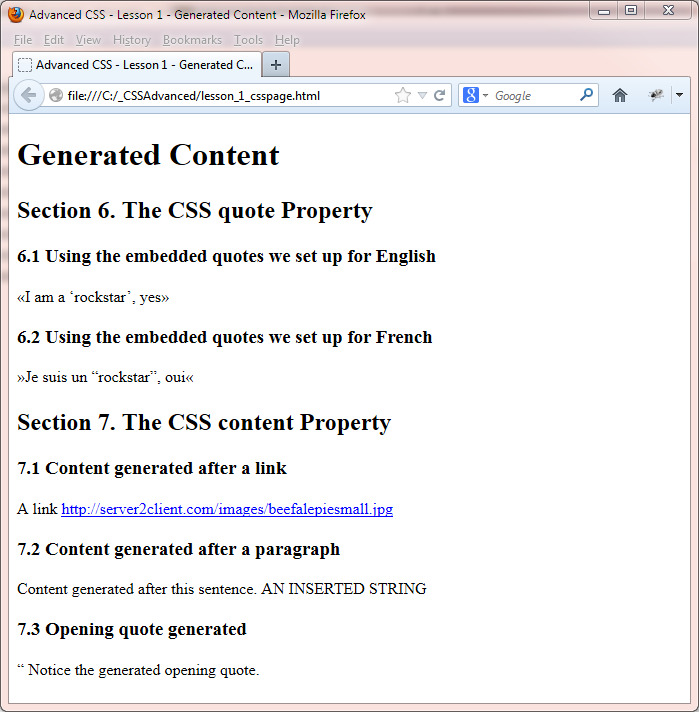 Used to generate content in a document in conjunction with the :before and :after pseudo-elements. Increments one or more counters set with the content CSS property. Resets one or more counters set with the content CSS property. Specifies quotation marks for any number of embedded quotations. 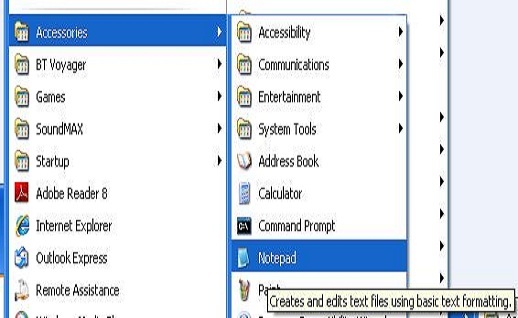 click the Folder option and call the folder _CSSAdvanced and press enter. Let's take a look at the generated content properties available to us in our first CSS advanced practical. Ok, with Notepad or a simlilar text editor open, copy and paste the following code into the editor. Content generated after this sentence. Notice the generated opening quote. In the Save in: tab at the top make sure you are pointing to the _CSSAdvanced folder we created above. From the C:\_CSSAdvanced folder, double click on the saved file and it will appear in your default web browser and look something like the following image. The first thing to notice from the screenprint, is the numbering for the <h2> and <h3> HTML tags. Two counters have been set up and the one for the <h2> HTML tag, the section counter, is initially set to 5. The <h3> counter we set up, the lesson counter, is reset each time a new <h2> HTML tag is hit. We then set up some quotes for English and French to generate quotes when the appropriate lang attribute is encountered. Finally we used the CSS content property with some of its values to generate some content. Play around with the code and use some of the other values available with CSS content property and check the generated content produced. Also play around with the counters till you're happy with using them. In the next lesson we take a final look at CSS selectors by looking at attribute selectors.